Wow! I cannot believe this is my last Behind the Seams™ with Stacy Igel post until 2013! 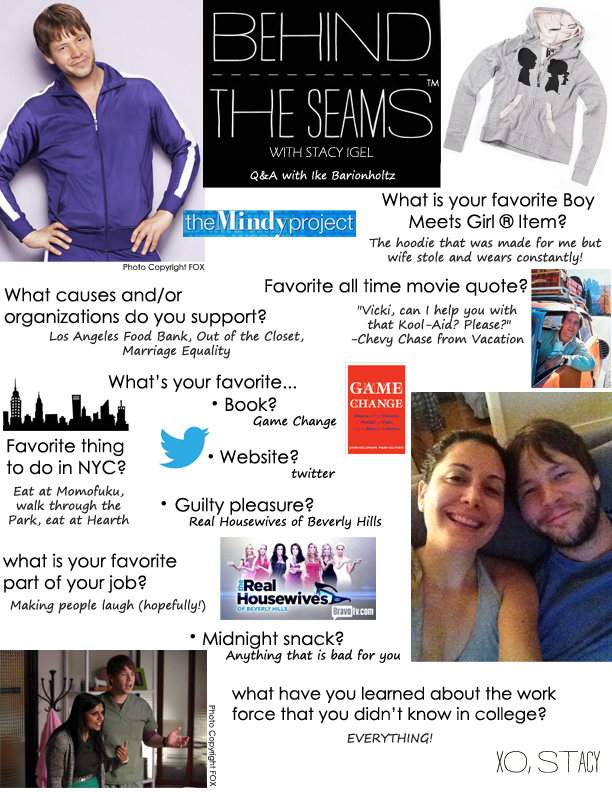 I am so excited about this BTS Q&A with my best guy friend Ike Barinholtz who signed my Ketubah(lol!). This is also my FIRST BTS with a BOY. And this Boy aka Ikey is one to know. Ike and I have known each other since we were 3 years old. I actually think he is my oldest friend in the whole wide world. Is that crazy or what?! I am going to try and keep this short because I have so much to say about my dear friend and now superstar but it is hard to condense into one paragraph. If you don't watch the Mindy Project make sure you DVR this show because Ike is hilarious in it and he is also one of the writers on the show with my other great friend David Stassen. Ike and I have similar journeys just in different fields. Building a career and a dream takes hard work and patience and over the past decade we have been cheerleaders for one another always on the sidelines rooting for each other. I will never forget visiting Los Angeles in 2001and Ike and our friend Seth Meyers driving me to Fred Segal and Lisa Kline to show my line. Ike and Seth would sit in the car as I went in with a rolling bag to show my designs to the store managers and buyers. I actually made a sale while they were waiting in the car for me! This is one of many things Ike has done for me as a friend. I am so excited for you to learn more about him all below. Enjoy! And thanks Ikey for being part of BTS. Everyone make sure to watch The Mindy Project, Tuesdays at 9:30pm EST on Fox! !